七五三 - "Shichi-go-san" literally means seven-five-three. 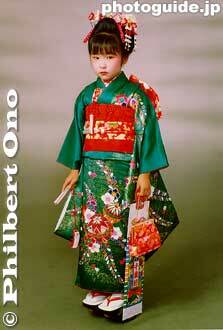 This is a Shinto-based, coming-of-age day on Nov. 15 for 7-year-old girls, 5-year-old boys, and 3-year-old girls. Although this is not a national holiday (like Coming-of-Age Day for adults in Jan.), many parents dress up their coming-of-age children in kimono and visit Shinto shrines for prayers around Nov. 15 (usually the closest weekend). It is also a busy time for portrait studios because many parents also dress formally and go to have family and child portraits taken before going to the shrine. Place: A temporary photo studio in a local department store.